I think that eating well should be dead simple. It shouldn’t require measuring things on a scale or counting calories or breaking out the TI-83, right? 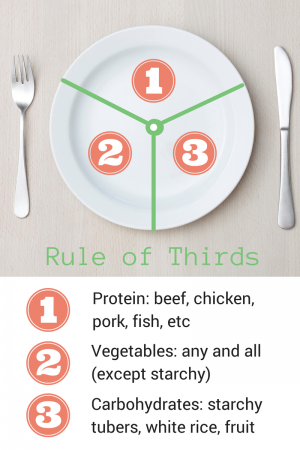 That’s why I tell my clients to follow the Rule Of Thirds for their meals – it’s easy to understand and it’s simple. 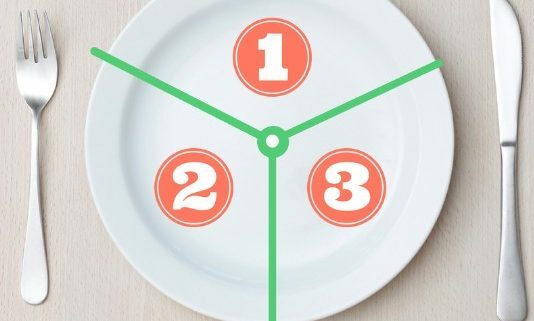 The Academy of Nutrition and Dietetics promotes a plate-model (and I’ll admit that I think showing folks their food on a plate makes it much easier to understand), but I don’t like theirs. While it’s certainly better than the old pyramid I still think we can do a lot better! The Rule of Thirds is my version. 1. Protein – This includes beef, chicken, lamb, pork, duck, fish, shellfish, etc. As much as possible, try to purchase humanely-raised grass-fed, pastured, organic, etc. Quality is key here! 2. Vegetables – any and all veggies, excluding only starchy vegetables which are included in the carbohydrates section. Variety is important! Don’t stick to the same vegetables all the time. Your gut bacteria (and the rest of your body) like to get different nutrients and antioxidants from different foods on a regular basis, so be sure to provide that for yourself. I see too many people stuck in food ruts these days – branch out and try new things! 3. Carbohydrates – these include starchy tubers (potatoes, sweet potatoes, yuca, taro, squash, etc), white rice, and fruit (all kinds). You’ll also want to include healthy fats like butter, ghee, tallow, lard, olive oil, etc – you can do this by using those to cook with (saturated fats only) and also adding some fat to your veggies (olive oil). You’ll also get high quality fats in the meats you’re eating (buy grassfed!). See? I told you it was simple. This is where everyone starts – it’s the template that you begin with and, if need be, we tweak as we go to make your diet perfect for you. But for most people, this is a really really healthy diet (and much better than the Standard American Diet of course!). The third most likely to change is the carbohydrate section, depending on how active you are, diseases or problems you may have, etc. But starting with all parts equal is the best place to begin – you can play around with it from there! 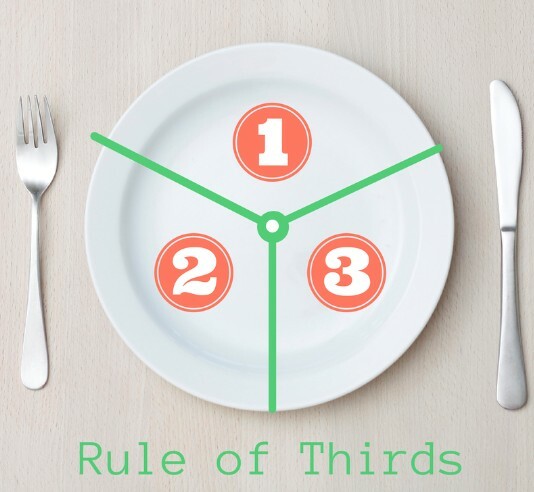 Do your meals follow the Rule of Thirds? I want to know! Share in the comments below. I was very low carb for seVEral years and got to a desirable weight, but have insomnia and anxiety. I chAnged to add more starchy carbs and I feel a little better, but have gained almost 10 lbs. does this mean I am eating too many starches?